As most of you who follow our posts know, we are big believers in PR over traditional advertising (ad placement). With that in mind, we thought you would be interested in a recent pr article we posted with the media. It’s an excellent study in getting the word out on your company in today’s media fragmented world. For several years, we have been sending what we call Diplomacy Cakes to world figures who are in the middle of a dispute. With each cake is a gift card made to look like it came from the other aggrieved party, suggesting that they get together to discuss their differences. The cost for this program is our cakes, packaging and shipping. We get no monetary benefit in return. On the surface, this might seem like a financially foolish move. But, there is value and sometimes that value can be much greater than the money we would receive from a two cake sale. You see when we send out these cakes, we also send out a pr piece to the media. On occasion, we may get some local media coverage but usually, they’re not picked up by the national media. But every once in a while you strike gold! A case in point is our most recent Diplomacy Cake venture. Is there a simple way to get Putin and Obama to agree on something? With the recent events in Ukraine further highlighting the increasingly frosty relationship between Russia and the U.S., diplomats from both countries are looking for any areas of mutual agreement. Chef J Stephen Sadler, the Executive Chef and owner of Crumbzz, an artisan crumb cake provider from Dallas, TX, thinks he has the answer. “Instead of breaking bread together, I say, let them eat cake”. And Chef J Stephen puts his money, or in this case his cakes, where his mouth is. For the past several years Chef J Stephen’s company, Crumbzz, has been shipping his artisan created old world cinnamon streusel crumb cakes to warring factions around the world. “There may be disagreements that can’t be bridged, but everyone loves home made crumb cake and if you can get warring parties sharing in even one thing, that’s a start”, says Chef J Stephen. This isn’t the first time Crumbzz has shipped their diplomacy crumb cakes to disagreeing parties. Obama has been the lucky recipient three times, House Speaker John Boehner and Senate Majority Leader Harry Reid have each received two Crumbzz cakes as well as Senate Minority Leader Mitch McConnell and House Minority Leader Nancy Pelosi, who have each received one. Crumbzz does not restrict the gifting of its diplomacy crumb cakes to political parties. Corporate America is well represented by Apple’s Steve Jobs, Microsoft’s Steve Ballmer and GE’s Jack Welch, media’s Phil Griffin, president of MSNBC and Roger Ailes Fox News Channel CEO have also received cakes. Even Hollywood and the sports world have received their share including; Kobe Bryant, Charlie Sheen and Robert Downey Jr., to name just a few. In an interesting twist, Crumbzz attaches a gold leafed gift card with each diplomacy crumb cake stating that the cake came from the warring party and suggesting that they get together to discuss their differences. Nonetheless, Crumbzz will be at it again, preparing to send Russian President Vladimir Putin his second cake and Ukraine’s President, Petro Poroshenko his first. Add’s Chef J Stephen, “Hopefully they can use our cakes as an excuse to call each other and start their conversation about how much they enjoyed their cakes”. A funny thing happened with this release. 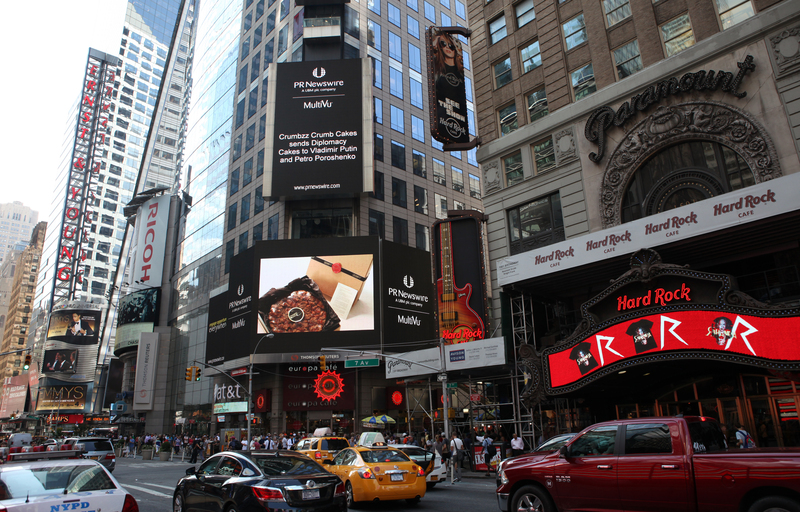 The headline “Crumbzz Crumb Cakes sends Diplomacy Cakes to Vladimir Putin and Petro Poroshenko” along with a picture of our gift cakes, hit the Thomson Reuters big screen in Times Square! What happened from there is true grass roots marketing at its best. With little or no marketing budget, one press release caused our phone to ring off the hook. People from across the country wanted to know how they too could send a pair of Diplomacy cakes to friends and family members who were in dispute. Don’t get us wrong, not all calls were for orders. We get plenty of emails and letters from people who think its a great idea and just as many who think we’re crazy. We’ve also gotten some wonderful letters from folks, thanking us for providing a tool to help them break the ice. But, the bottom line is, we’re getting plenty of attention from many folks who had never heard of Crumbzz before our release. To assure we maximize our coverage of this event, we even sent a follow up press release letting the local media know about our fortunate placement in the heart of New York City. What made this release so newsworthy? Key words is the simple answer. No one cares about a crumb cake like we do. And believe us, although your product may be the highlight of your life, unless it’s another iPhone, no one will care about your product either. But key words on trending issues make news. And we used plenty. Vladimir Putin and President Obama, House Speaker John Boehner and Senate Majority Leader Harry Reid, Senate Minority Leader Mitch McConnell and House Minority Leader Nancy Pelosi, Steve Jobs, Microsoft’s Steve Ballmer and GE’s Jack Welch, Phil Griffin, president of MSNBC and Roger Ailes Fox News Channel CEO, Kobe Bryant, Charlie Sheen and Robert Downey Jr. and of course Petro Poroshenko the President of Ukraine, were all mentioned. Each one of those names is trending and is picked up by thousands of media sources. Was the program designed to generate media attention? No, the idea actually came over the dinner table while discussing an ongoing disagreement with a family member. We decided to send one of our cakes along with a note. And then like a bolt of lightning, it hit us, if it could work for our family, why not for other’s. Sending it to well known protagonists is where the pr value of the Diplomacy Cakes came in. A Diplomacy Cake may not be the right strategy for your company, but you get the idea. You must stand out from the pack to get attention. In our case, sending Diplomacy Cakes fits our brand, is produced at minimal cost for potential maximum return and is, to be quite honest, fun to do.